The 1969 Holden Hurricane is a mid-engine, rear-wheel drive, two-seat sports car incorporating a remarkable array of innovative features and technology, much of it years ahead of its time. 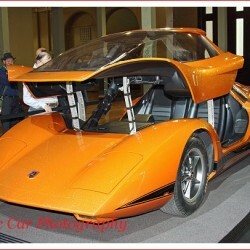 Originally debuted at the 1969 Melbourne Motor Show, the fully restored Holden Hurricane concept car was displayed to the public at the Motorclassica car show held at the Melbourne Royal Exhibition Buildings in October 2011. Classic Car Photography was there with our camera! However, the popularity of the Hurricane meant that it was next to impossible to take any shots of the car without it being surrounded by curious spectators. The project to restore RD 001 began in 2006 and was a genuine labour of love for some very dedicated Holden employees. The entire restoration process was driven primarily by volunteer labour from Holden designers and engineers in their spare time. But the Hurricane first entered Holden Design in less than immaculate condition. RD 001 had a residency in a trade school where apprentices practised their welding on the priceless concept. After being returned to Holden in 2006, the Hurricane restoration project took many thousands of painstaking man hours to lovingly restore RD 001 to concourse condition. Holden’s Manager for Creative Hard Modelling, Paul Clarke, was largely responsible for managing the restoration of RD 001. He ensured as many of the original parts as possible were used or remade using modern techniques to 1969 specification, in order to preserve the authenticity of this hugely important Holden. The entire team has done a fantastic job in bringing this beautiful concept back to life. The talent we have within the Holden organisation is simply outstanding. Every time we take on a project I’m constantly amazed by the passion and talent in this company, making it a genuine pleasure to work on these projects. The Hurricane plays a crucial role in Holden’s story and the company has such a great sense of history and heritage that it was very important to bring RD 001 back to life. It’s been a challenging but incredibly rewarding process. Click Here to see more from Holden about the Holden Hurricane restoration project.